Every few years, the existence of abandoned subway stations becomes front-page news that somehow sweeps the nation. With the onslaught of attention paid to the Underbelly Project in the South 4th Street shell, it was only a matter of time before reporters decided to revive their old stories on dead subway stations. Even though Transit has been allowing customers to ride the City Hall loop on the 6 train since early 2007, Huffington Post, Jalopnik, Fast Company and Yahoo! News decided to splash this story across their respective front pages last week. Their coverage echoes that found in an Associated Press story from 1984. I can certainly appreciate the fascination with which those unfamiliar with the intimate details of the New York City subway system treat abandoned stations. The City Hall stop, in particular, has been exceptionally well-restored and maintained, and it’s timelessness and emptiness serve as a window into an era of city planning lost to today’s utilitarian approach. Still, it is a crown jewel with a very public history and one that shows how planning needs change as time wears on. In the beginning, the City Hall stop was indeed the so-called crown jewel of the nascent subway system. Designed by Rafael Guastavino and Heins & LaFarge, the station served as the launching point for construction for subway construction in 1900 as then-Mayor Robert Van Wyck celebrated the groundbreaking. Four years later, Mayor George McClellan would usher in the age of public transportation as he helmed the first northbound IRT train to depart from the City Hall loop. As early as 1965, the Transit Authority considered using the City Hall stop as a museum. “The station is unique, and to convert it into a museum is in the tradition of preserving the historic landmarks of our city,” TA Commissioner Joseph O’Grady said. Eventually, the TA chose the IND Court St. station instead. The authority did not want to construct a new loop for the Lexington Ave. local trains and could not store old BMT and IND train cars on the City Hall loop due to the varying car widths. In 1995, the idea finally seemed to gain fiscal traction and political support. Mayor Rudolph Guiliani gave the project his thumbs up as a tourist destination, and the MTA secured $750,000 in federal funds to make the museum a reality. At the time, the authority hoped to raise $2.4 million in private donations and kick in another $350,000 for the museum. The Transit Museum planned to restore the oak token booths and construct a glass partition to dull the screeching sound of the 6 as it looped through the curved station. By 1997, the Transit Museum still hoped to open the station as a museum by the following, but the price tag had risen to $10 million. Museum officials were predicting upwards of 200,000 visitors annually, but while the tours were ongoing, no firm plans to start construction emerged. As seen in this blue print, the eastern-most end of the City Hall subway loop is directly beneath the Mayor's office. Two years later, Mayor Giuliani quashed the museum over alleged security concerns. Because federal terrorism suspects were being held in the nearby courthouse and because the front end of the station is directly under City Hall, the mayor believed a museum underneath his office presented a potential target. “There would be significant security concerns about creating public access to an area that is literally underneath City Hall,” Edward Skylar, a Giuliani spokesman, said. Giuliani won that battle, but the MTA spent $2 million to shore up the station anyway. 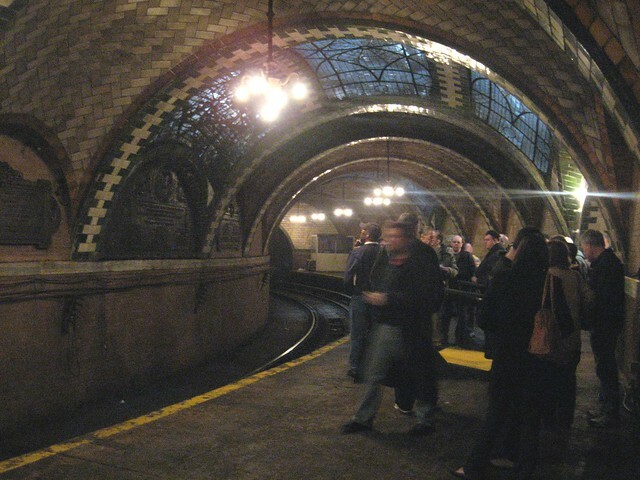 The structure, not very deep underground, had to be shored up to ensure that trains could still pass through the arches, and in doing so, the MTA allowed the Transit Museum to lead tours for members interested in stepping foot in this abandoned station. Today, we still debate the potential uses for abandoned stations. These former public spaces lie empty and neglected as various groups have proposed using them for restaurants, art galleries, shopping areas or even just officially-sanctioned memorials to another era. Sometimes a group of street artists come along to turn a forgotten station into a front-page art gallery, and other times, concerns about terrorism — overwrought or not — work to deprive a city of ready access to a beautiful abandoned subway stop. The alleged security concern with re-opening City Hall station was one of many over-wrought and over-thought responses to 9/11. I believe Park Row has never fully re-opened. The loss of bus service there is more prosaic, but of more practical impact to those who live and work in the area. Park Row is still closed to private vehicles but I think the total prohibition on buses and pedestrians from the early days following 9/11 has been lifted after the outcry from people in Chinatown. A bunch of the routes in Lower Manhattan were reconfigured, but the M9 and 103 both travel on the restricted section of Park Row today. Here is more on the Park Row situation. IMO, that situation involves a bunch of overblown security concerns that are negatively impacting a high density residential area. There should be a happy middle ground that doesn’t deprive an area of its urban vitality. Is the City Hall spaces rented for parties? Thinking of Chicago’s innovative funding again, but you can rent a train that runs around the Loop in the evening. Art parties, student fashion shows, and other events have all been done on rented trains. I believe the trains going through the City Hall station are incredibly loud, so anything longer than a tour would be tough on the ears. Renting a train is another story – I imagine it would be possible. The only real way the City Hall station works as a Transit Museum would be to Plexiglas the edge of the platform and simply use the station as a “working model” possibly with small display items on the platform, while digging out some sort of tunnel connection to the BMT’s lower level City Hall platform, where the museum fleet could be housed. That would allow the Lex local to continue to use the loop, and would actually give the fleet more exhibition space, since lower City Hall is a three-track set-up. But it would also cut the number of N/R trains that could be stored between City Hall and Canal Street during non-rush and off-hours, so logisically that would create a problem. Moving the Museum to lower Manhattan would probably boost admissions, but given the MTA’s current financial status, the money needed to make it viable isn’t anywhere close to being there. The plans in the late 1990s wouldn’t have involved relocating the fleet. That was discussed only in the 1960s. The museum plans in the recent years have focused around showcasing the station itself and turning the stop into a museum annex. Instead, the beautiful station as a museum annex, we have that sterile box in Grand Central. Besides that, they actually need the yard space at the BMT City Hall station, and tunneling to it would somewhat spoil the ambiance of the existing station. This thread is probably dead, but i have a question for any history buffs. The picture of the station above (track picture) shows the old side platforms at the brooklyn bridge station. The northbound local platform has a “arm” that shoots out of it. Anybody know where that would of led to? Whenever i’m in that area, there is a underpass that connects the muni building to pace university (more or less). This seems to be where that local platform would of been and one of the walls has newer tiling compared to the original stuff (thinking thats where this “arm” is hidden). So anybody have any ideas? It’s a now-closed entrance that’s on the Brooklyn Bridge. If you’re walking across the bridge, toward Brooklyn, approximately 20-30 yards up the bridge, you pass a staircase that leads underground. It used to lead to the station, but I believe it no longer does. Thanks Ben! Ive been down that staircase myself thinking that was what it was too, but it led to the street underneath the bridge. Maybe there was another passage off that passage that was sealed up long ago.